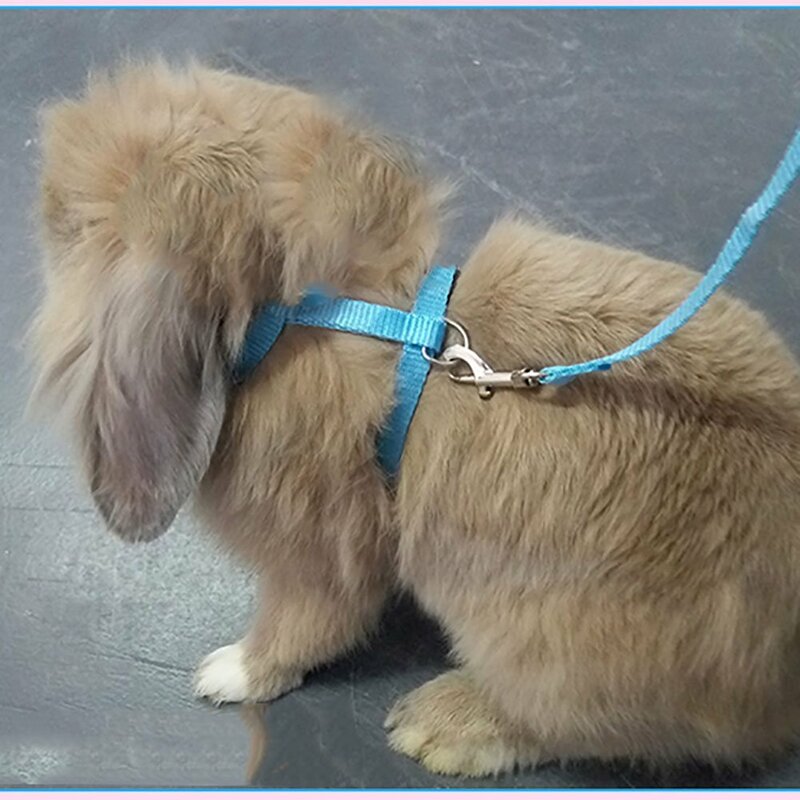 Home Pet Rabbits Bunny On A Leash – Can You Walk A Rabbit? 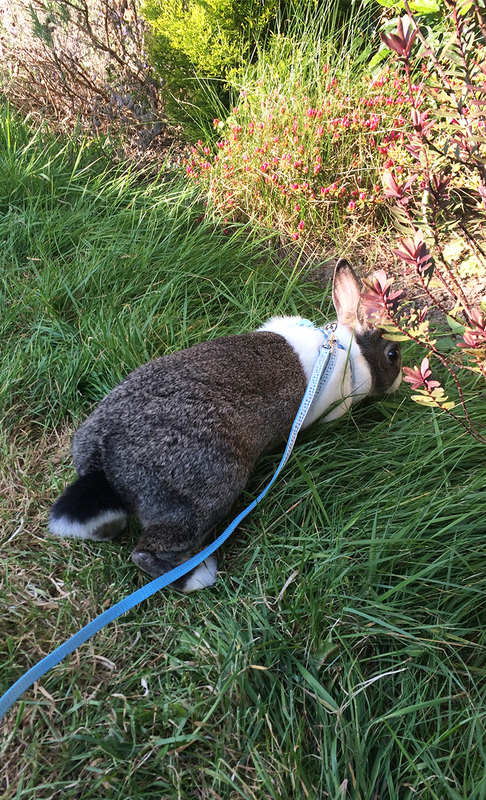 Bunny On A Leash – Can You Walk A Rabbit? I have a bunny on a leash! Do you want to have one too? Let’s take a look at the benefits of walking your rabbit, and how to do it safely and in a way that’s fun for both of you. Including video of my very own rabbit on a leash, Coco! Bunnies aren’t just cute. They are intelligent animals, who need lots of entertainment and loads of exercise. 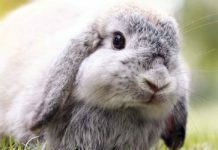 If want your bunny to stay in tip top condition, then rabbit walking could be a great way to help. You will be pleased to hear that yes, you can walk a rabbit! In fact the rabbit you can see pictured in this article is my very own bunny on a leash – Coco! She’s about 5 months old, and a lively, loving little girl. She’s got a very big hutch and a huge run in the back yard, but little Coco was clearly getting cabin fever. Unlike our other chilled out bunny, Bing, Coco craves our attention. When you walk past her run she follows you down the side, standing up on her back legs and begging for a cuddle. She wants to be together all the time. So I thought, why not see if there is a way that she can be! I have also used harnesses and leashes with my ferrets when I was young, so I had a good idea of how it could be done. If you want to go for a bunny walk, and emulate a dog walk with your tiny friend, you might be tempted to use a rabbit collar. Technically, it’s possible to put a collar on a rabbit. But it’s not something that I would personally advise. 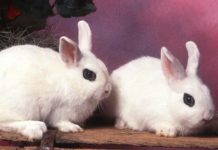 Most rabbits life in hutches, cages or outdoor runs. A least part of the time. These enclosures are all full of stuff. Bars, toys, water bottles and hay racks. They are all potential places that a collar could get stuck. As you are unlikely to watch your bunny 24/7, putting them in something that could get stuck and at best cause them severe stress and at worse injury, is not a good idea. What if you only want your rabbit to wear it’s collar when you are using a leash? Well, there is a problem here too. Did you know that lots of dog owners don’t use collars anymore? They just put their dog’s tags onto their harnesses! The reason for this is that collars pull at their necks. Necks are very delicate, and when your pet tugs forwards on the leash they will be putting force through their little necks. Given how small your bunny is compared to you, this is something you will want to avoid. 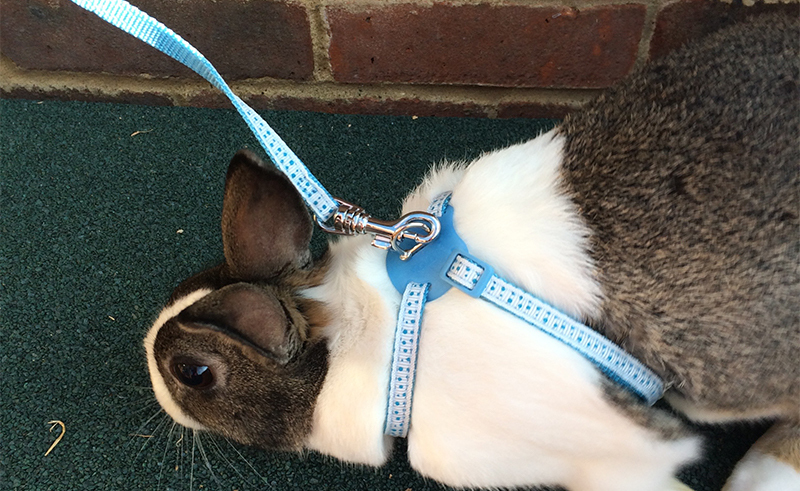 So let’s take a look at the best way to put a bunny on a leash – with a harness! A harness for rabbits might sound like a funny idea, but it’s actually great. 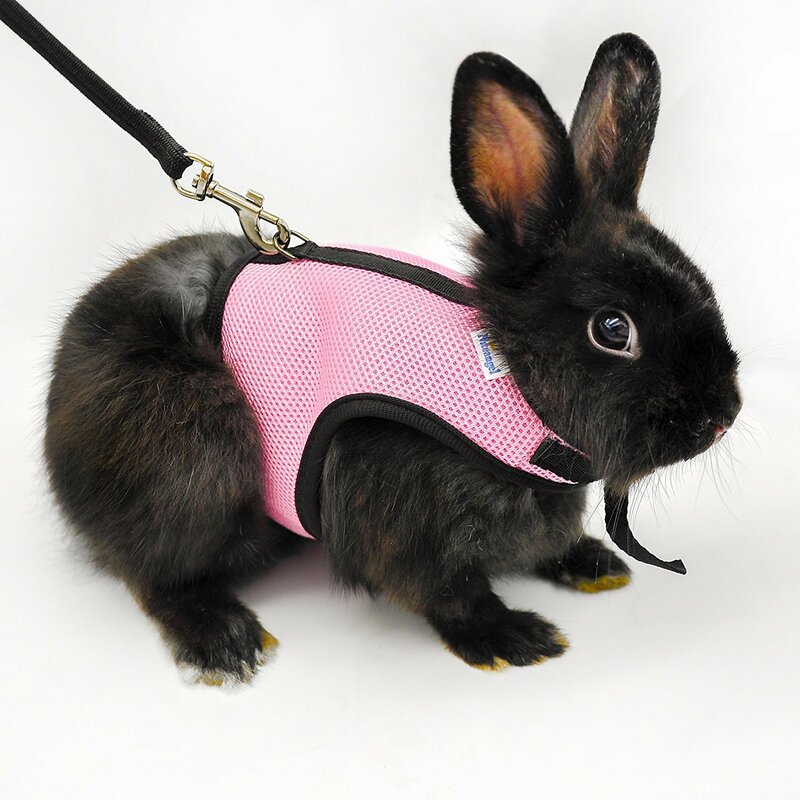 Harnesses are designed to cradle your pet’s body in a way that if necessary supports the pressure the rabbit lead puts onto them and spreads it out over the shoulders. Now, you shouldn’t be tugging at your bunny’s leash ideally, (we’ll look at what you should do in a minute), but you can never know when they might suddenly run forward and cause that pressure themselves. This way it keeps them nice and safe regardless. The best rabbit harness is one that fits snugly but comfortably. I chose this harness for Coco and Bing. It should have a loop that goes over their head and sits around their shoulders, and another that goes under their tummy. I’ve put this harness on both my rabbits, and had to adjust it quite a bit between. Bing is a Netherland Dwarf and Coco is a Dutch rabbit, so they are quite different sizes. But once you have got the sizing right the process of putting it on them is the same. Unclip the harness so it’s laying loose at one end. 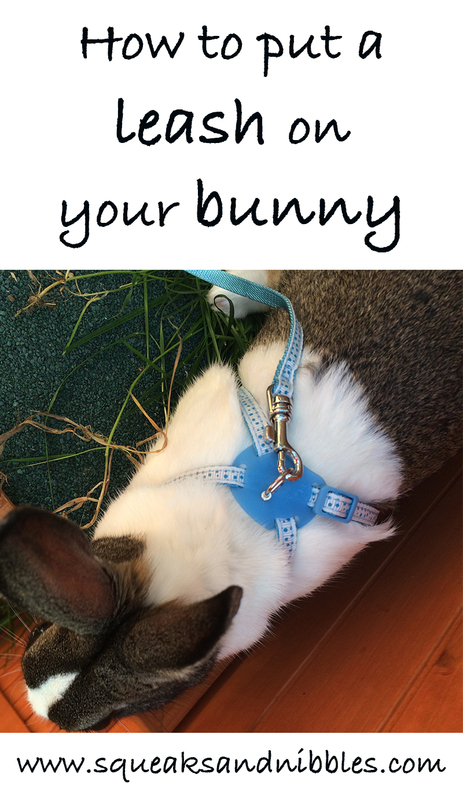 Adjust the size by pulling one end of the harness to make a loop big enough to put it over your bunny’s head. The open end will then be used to go around under their body. Now, both my bunnies are very friendly. But in slightly different ways. Bing will sit still and calmly when being handled, so it was very easy to clip the clash underneath him. Coco is very interested in whatever you are doing, so she kept trying to have a good look. If your bunny is interested like her, then just pop a treat in front of them to distract them for a few moments. Coco loves dandelion leaves, so I popped a few in front of her whilst I clipped under her tummy. Make sure when the harness is on that it is tight enough. You could be able to easily put a finger under it anywhere, but no more than that or it might be loose enough for your bunny to slip out and run off. So, now you have a rabbit on a leash! What next? Let’s start in the back yard. Carry your bunny to somewhere familiar, with a clear space. No trees, toys or garden furniture. Nothing the leash could get tangled around and cause a fright. Pop her down on the floor and give her something tasty to munch on. What happens next will depend upon your bunny’s personality. When I put Bing in the harness on the leash, he ran around like a mad thing. Ignored my treat offers completely. Hopping, jumping and generally trying to put as much distance between him and I as possible. You can probably see why I haven’t managed to get any photos of Bing on the leash. When I put Coco onto the lawn, she munched at my feet, then asked me for a cuddle. Putting her feet on my knee or chewing my shoe. After a few minute she hopped about a bit, always staying nearby and allowing me to easily walk after her around the back yard. Can you walk a rabbit on a leash? Well, the answer by now is clearly yes. But let’s talk about going for a walk with a rabbit. Like you’d go for a walk with your dog. I think it depends upon your rabbit and his or her personality. This photo was taken just after I’d put the harness on Coco. Look at her body language. Your rabbit’s body language will give you indications if they are worried. She’s pressed her front end against the ground. Her eyes are also very wide. This tells me she’s a bit worried, though not very worried. As when Coco is very upset (a sudden loud noise for example) her ears fall flat too. She only pressed down like this for a minute or two, then was back to her normal happy self. 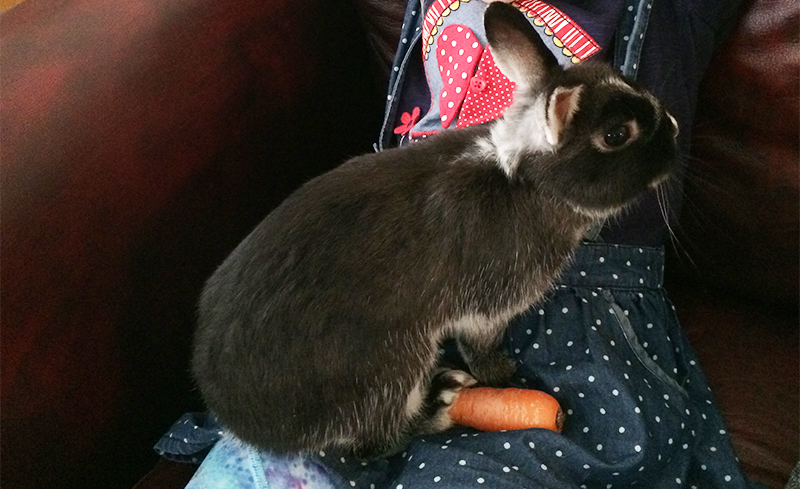 If your bunny seems unhappy in her harness, try giving her some tasty treats. If this doesn’t perk her up, take it off and try again for a short period the next day with lots of lovely yummy treats. Only start to keep it on for longer when she starts to seem more comfortable. Bing was confident from the very beginning, but gave me a different issue once the leash was on. Whereas Coco was initially worried, she loved the leash pretty much straight away. If I lived somewhere more rural with less cats and dogs, I’d be tempted to try taking Coco out and about on the leash. I’d never try it with Bing without some training. There is a difference between training and getting them used to something. Coco’s natural inclination to always be near me, means I can gently change directions when we’re in the back yard without risking tugging at her leash. She loves being together. So if I want to walk Bing on the leash properly, I’d need to train him to walk on a lead. The best way to train any animal, is with a clicker. It might sound crazy, but all you need to do is follow these positive reinforcement based clicker heel tips and apply them to your bunny! If I have time to give it a go one day, I’ll report back on how long it takes. Let me know in the comments section if you have a clicker rabbit! If your rabbit loves staying close, loves the leash and has fun with it, then you might like to take her for a walk. But be careful, there are lots of risks in leash walking a rabbit. Depending upon where you are, there will be some diseases that might be a problem. Wild rabbits in the UK carry myxomatosis, which your vet will be able to offer a vaccination and advise you on. 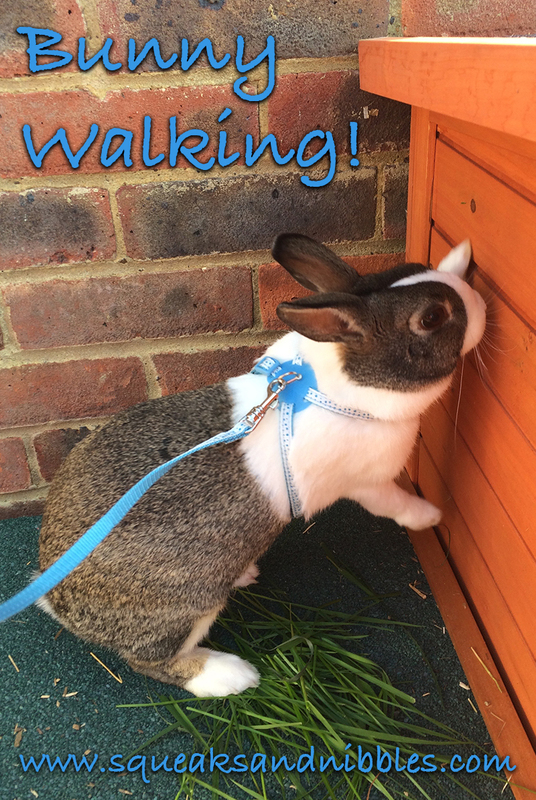 Dogs, cats and even other people are a risk to your rabbit walking. The people because they might not notice your small friend, the dogs and cats because they might take a bit too much notice. If you see any of them, scoop her up in your arms until they are out of the way. Go to an area which is not very busy or popular with dog walkers, and at a time when it’s likely to be quiet. Make sure your rabbit has had several weeks of daily leash time in the back yard before you venture somewhere new. Don’t tug on the leash, let your bunny guide you or wait for them to catch up as you go in the direction you want to. Only take a rabbit you can confidently carry and handle. 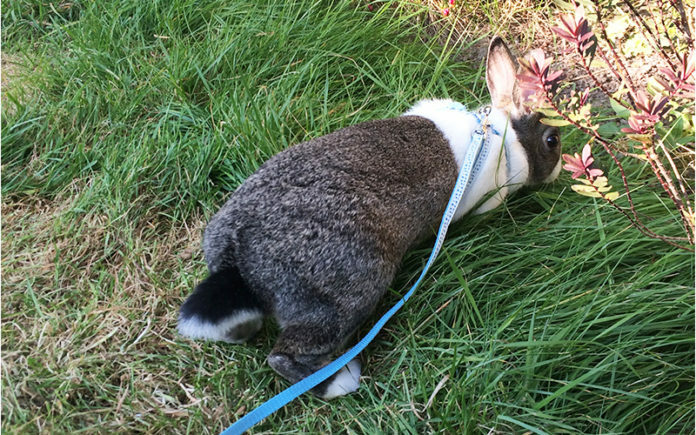 Having a bunny on a leash is a brilliant way to exercise, bond and keep her mentally stimulated too. And above all, stay safe! Do you walk your bunny on a leash? Why not let us know in the comments section below! Next articleHow Often Do I Feed My Hamster? The other day I was leaving the public library and walking to my car. I noticed an elderly woman standing on the side walk holding a leash attached to a harness around a rather round ball of black fur. I thought the animal was a very small dog, but upon a closer look it was a black rabbit. She said that he was about four years old and I could pet him if I wished. After I finished petting him, he quickly licked his front feet and wiped his head. As she walked back to her car, the rabbit hopped along side her! I have a rabbit named Sydney. She is about 2 years old, But she seems to be afraid to go anywhere near outside because I have four dogs and one has brought home dead rabbits, But we have a crate and when we put the dogs in the crate she goes outside but then she just freezes once we get on the deck. Please give me a few suggestions on how to make this work.